For those not in the cult B-movie know, 'Killer Klowns from Outer Space' is a 1988 American science fiction horror comedy film written, directed and produced by the Chiodo Brothers, and starring Grant Cramer, Suzanne Snyder, John Allen Nelson and John Vernon. In fact, it is the only film to be written and directed by the Chiodo Brothers. The film is about a clan of evil aliens from an unknown region, who all resemble circus clowns. They arrive on Earth and invade a small town in order to capture, kill, and harvest the human inhabitants to use as sustenance. Killer Klowns from Outer Space was filmed in Watsonville, California and at the Santa Cruz Beach Boardwalk. The film utilizes practical effects, including rubber suits! Having received generally positive reviews the film is now considered a cult classic. 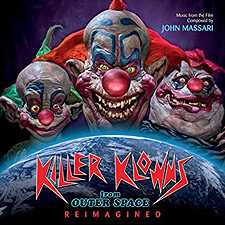 Now, come May 25th, 2018, Varese Sarabande are proudly releasing the reimagined soundtrack to the very same cult classic, Killer Klowns From Outer Space. The project has been a labor of love for original composer John Massari who spent two years assembling a top-notch Hollywood orchestra, enlisting famed composer Bear McCreary (Walking Dead, Outlander), and who even asked The Dickies to record a new version of the theme song! Trust me when I say that this release will appeal to the large cult following for the movie as well as those who love thematic, orchestral film music. Listening now to all these cult, 30 year-old tracks coming to life in quite a way I never even considered could ever happen, is, well, just ... killer! Backed now by a live orchestral score conducted by John Massari himself, the Reimagined soundtrack is phenomenal, of that you have my word. Indeed, the original score of the album is performed by members of The Hollywood Chamber Orchestra, with new orchestrations by not just Massari, but also Bernhard Eder. As aforementioned, even The Dickies recorded a brand new version of the film’s theme song; this one now enhanced with a rather apt, yet nonetheless bloody creepy vocal introduction!